Case report of a young adult male in whom a rare hypercoagulable state - Factor V Leiden heterozygous mutation and concurrent Antithrombin III deficiency predisposed to Mesenteric venous thrombosis and consequent small bowel gangrene. The case is reported in view of its rarity and to emphasize the importance of detecting such prothrombotic disorders at an early stage to prevent or minimize such morbidities. A 30 year old male of Lebanese nationality presented with symptoms of acute abdomen. CT angiogram of the abdomen was done, showing suspected mesenteric ischemia and superior mesenteric vein thrombosis. Emergency Laparotomy was performed; segmental resection of small intestine including part of jejunum and ileum was done comprising of two gangrenous segments each around 15 cm and intervening viable segment, followed by primary anastomosis. Gross and microscopic examination showed extensive coagulative necrosis involving distal jejunum, part of ileum, edema of bowel wall and venous thrombosis involving intramural and mesenteric veins. Further diagnostic workup revealed Factor V Leiden Heterozygous mutation and Antithrombin III deficiency. The patient was anticoagulated initially with unfractionated heparin then enoxaparin and subsequently on Warfarin targeting INR of 2 to 3, with close monitoring of INR and has recovered well, presently doing fine 1 year post-surgery Venous thrombosis associated with hereditary hypercoagulable states and consequent bowel ischemia is a rare but potentially life threatening condition. Recognition of predisposing conditions by screening strategies, especially in susceptible populations could prevent such eventualities. A 30 year old male presented with acute abdominal pain and clinical signs of an abdominal emergency. CT angiogram of the abdomen done and showed superior mesenteric vein thrombosis (Figure 1). There was no significant past or family history. Haematological parameters were in the normal range including Prothrombin time and activated partial thromboplastin time. A hypercoagulable state was suspected clinically and blood sample was obtained prior to surgery in order to investigate further on these lines. Figure 1. CT angiogram showing mesenteric vein thrombosis (Blue arrow). Emergency laparotomy was done. Segmental resection of the small intestine, including part of jejunum and ileum, was done to remove two gangrenous segments, each around 15 cm and the intervening viable segment, followed by primary anastomosis. Intraoperative image of gangrenous bowel segment, highlighted in Figure 2. Figure 2. 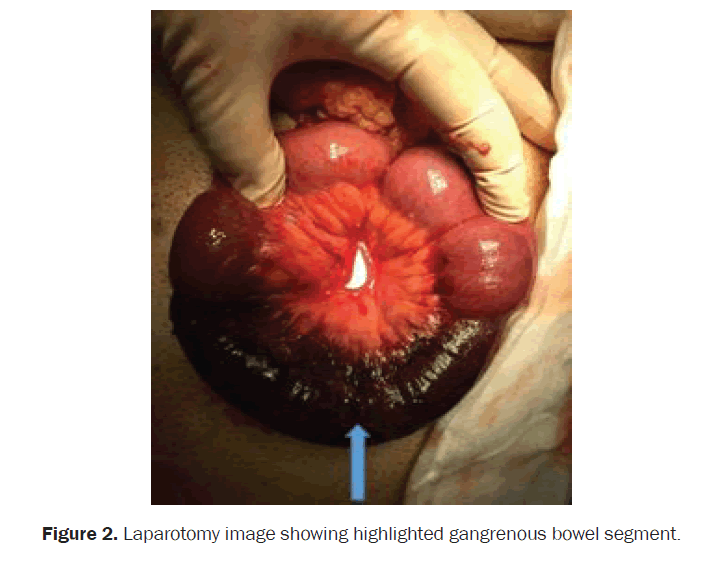 Laparotomy image showing highlighted gangrenous bowel segment. On Gross Examination: Segmental resection specimen of small intestine including part of jejunum and ileum measuring 37 cm, with proximal and distal gangrenous segments measuring 15 cm each and intervening normal appearing bowel. Gross image of external surface of small bowel in Figure 3, cut section of bowel, shown in Figure 4 gross images. Figure 3. 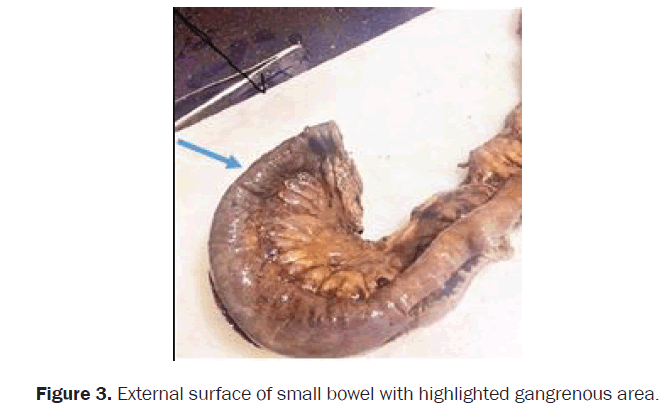 External surface of small bowel with highlighted gangrenous area. Figure 4. Cut surface with clear demarcation between viable and necrosed segments, with highlighted necrosed area. Extensive gangrenous change of distal jejunum, part of ileum and focal areas of mesentery, extensive venous thrombosis involving intramural and mesenteric veins, as shown in microscopic images Figures 5 and 6. Figure 5. Junction of viable and necrosed small bowel segments, highlighted in the figure. Figure 6. Congested intramural vein, highlighted in the figure. Further diagnostic workup was recommended to rule out a hypercoagulable state. The parameters tested and their results were as follows, elaborated in Table 1. Table 1. Parameters tested and their results. Of the above tests, factor V Leiden (heterozygous) mutation detected by PCR and reduced Antithormbin III activity; by chromogenic assay were significant findings which contribute to understanding of the case. Table 2. Worldwide prevalence of factor V Leiden mutation . Mesenteric Venous Thrombosis is a life-threatening condition due to the risk of mesenteric ischemia with high mortality. Besides factors related to local injury, local venous congestion, cancer and previous venous thromboembolism, inherited and acquired thrombophilic factors are present in a substantial proportion of patients with mesenteric venous thrombosis . Common course of treatment and follow-up for individuals with prior episode of mesenteric venous thrombosis is oral anticoagulant prophylaxis with strict monitoring of INR. Factor V Leiden mutation was found to be the commonest hereditary thrombophilia associated with mesenteric venous thrombosis with a percentage of 9%, in a systematic review of published literature over a period of 15 years . Worldwide prevalence of factor V Leiden mutation in general population has been found to be as explained in Table 2. Interestingly the patient is of Lebanese nationality, a country with high prevalence of this abnormality. Antithrombin III deficiency is a much rarer abnormality, its prevalence in the general population has been found to be about 0.02%, however the prevalence of both these conditions has been found to be much higher in patients with a single episode of venous thromboembolism and in thrombophilic families . All these factors indicate that population based screening for common inherited thrombophilic disorders such as factor V Leiden mutation could be considered in high prevalence areas and in relatives of individuals with such abnormalities, regular clinical examinations performed to detect such eventualities prior to progression towards life threatening emergencies, as well as oral anticoagulant prophylaxis could be offered to individuals on a case to case basis by discretion of the physician. Acute mesenteric ischemia due to venous thrombosis is a rare but potentially fatal condition. Recognition of suggestive clinical symptoms, predisposing factors, epidemiological data regarding susceptible populations and relevant family history are important in initiating relevant investigations, prompt diagnosis and commencement of prophylactic anticoagulant treatment to minimize and prevent such eventualities. Written consent was obtained from the patient and the family for the publication of this case report and any accompanying images. Singal AK and Kamath PS. Mesenteric venous thrombosis. Mayo Clinic Proc. 2013;88:285-294. AÃÂaoÃÂlu N, et al. Prevalence of prothrombotic abnormalities in patients with acute mesenteric ischemia. World J Surg. 2005;29:1135-1138. Garcia MC. 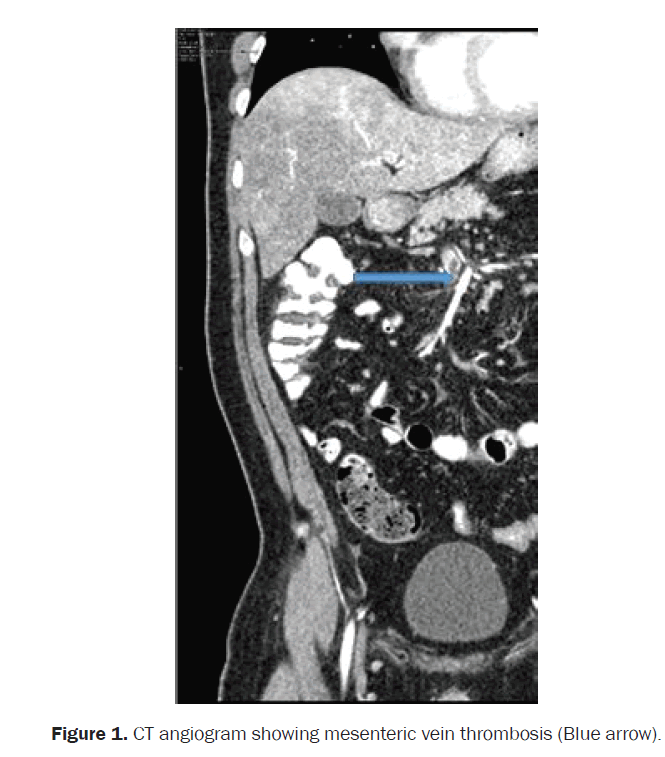 Small bowel varices secondary to chronic superior mesenteric vein thrombosis in a patient with heterozygous Factor V Leiden mutation: A case report. J Med Case Rep. 2015;9:210. Korovin, et al. Concurrent factor v Leiden and protein c deficiency presenting as mesenteric venous thrombosis. Am Surg. 2016;82:e96-e98. Grouzi E. Portal, splenic and mesenteric vein thrombosis in a patient doubles heterozygous for factor V Leiden and prothrombin G20210A mutation. Blood Coagul Fibrinolysis. 2009;20:722-725. Garlipp B. APC resistance due to factor V Leiden mutation presenting as acute haemorrhagic jejunal infarction- Case report. Gastroenterology. 2009;46:206-210. Famularo G. Mesenteric and portal vein thrombosis associated with hyperhomocysteinemia and heterozygosity for factor V Leiden mutation World J Gastroenterol. 2005;11:7700-7701. 'Leiden' gene mutation. J Assoc Phys India. 2003;51:611-613. Sönmezer M. Mesenteric vein thrombosis in a pregnant patient heterozygous for the factor V (1691 G --> A) Leiden mutation. Eur J Obstet Gynecol Reprod Biol. 2004;114:234-235. Chryssostalis A. Chronic abdominal pain due to bowel ischemia in a patient with Leiden factor V mutation. Gastroenterol Clin Biol. 2004;28:301-303. Otrock ZK. Portal, splenic and mesenteric vein thrombosis in a patient with factor v Leiden mutation and anti-thrombin III deficiency. Ann Hematol 2006;85:413-414. Kujovich JL. Factor V Leiden thrombophilia. Genet Med. 2011;13:1-16.